Geeky products are the coolest items to give your geek friend as a gift like the geeky captions on mugs, fashionable phone cases or anything like these, but now that list has changed to a new one as collected below in this article. The world is becoming tech and so the day to day gadgets are also transforming to the better. Check out these geek products that are priced under $15 only. A microphone supported earphones has an embedded LED string inside the cable that glow like a christmas tree over you. We do not know about the audio quality, but it surely brings a festive joy all around you. Another everyday gadget that is geeky. This is a flameless lighter that can be charged with the help of any USB port. As it does not flame, it is safe to carry with yourself to anywhere, be it movie theatres, markets or any other place. It lasts for many days after a single charge. It gives you a great convenience to manage your PC and Apple devices using only one cable for both of them. It has one end with a USB connecter and another end with lightning as well as micro USB ports that allow you to connect, fast charge and sync using these ports all in a single wire. It is a 2-in-1 solution that can be used for any of your device. A card shaped gadget that works as a ruler, nail puller, multi-head screwdriver, fruit peeler and a bottle can opener. Pair it with a credit card and it transforms into a mobile stand as well. Don’t know how to make any decision about anything? Try this magnetic decision maker ball. Just give it a shake and it will solve your queries. Call it superstition or fun, it can decide your fate, but do not take it seriously for your major decisions (just saying). Want to make your conventional light bulbs to act smartly, get an I-switch. Fit one bulb to this gadget and it then glows with sensors. It lights ON and OFF using an inbuilt motion sensor and infrared sensor that sense human presence in room. Make your phone photos and selfies more fine with the perfectly lit surroundings. If your camera flash is poor or missing, try this Mini Flash. Connect it through the 3.5 mm jack of your smartphone, and you will get the power of 16 LED lights as flash. Not a normal fan, but one that displays custom messages of your phone connected with USB port. It uses a completely programmable 7-LED assembly that can display 16 characters. The gadget can also be powered by batteries. The light can be set to an angle owing to the flexible neck of it. Plug in the anti-dust plug into its 3.5 mm audio jack, and your smartphone will become smarter. It has a smart key on its top which can be programmed to do many preconfigured functions. You just click the key and it follows your command, even without unlocking your smartphone. Wanted to shut off the shouting alarm clock when it wakes you up in the morning. This geeky gadget can make you do this. Take the gun and shoot the bullseye 5 times within 3 minutes. You can also change modes to test your speed. It is a plug and play device that keeps everything cool and safe by taking hot air outside of the system. It is powered using a USB port and it is compatible with most of the notebooks because of its universal clip. You also get an LED indicator and the ability to rotate it up to 180 degrees. How about a notifier that notifies you about every mail that you receive in your inbox. Yes, this gadget will never make you miss out on these. It can handle many email accounts. It also has a USB hub to connect many USB devices together. These are cover plugs made of silicone that cover your laptop’s unused ports which are not used all the time or are not used frequently. These prevent dust and even water or any liquid from entering laptop’s or any device open ports. The pack of 13 pieces of plugs can be used for almost all types of ports such as USB, VGA, SD card, HDMI, audio, microphone, etc. Imagine waking up in the middle of the night in total darkness and you have no idea of where the light switches are. Just pull the Light pull bulb to make it glow gentle and dim and guide you with the light. It also works as a night lamp. 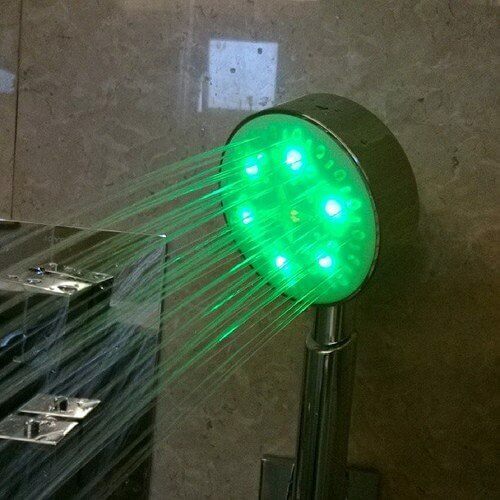 These multi-color LED shower heads light up using the steam generated within it and it dynamically changes its colors according to the water flow. It has 7-color LEDs placed on it. It is a pack of playing cards that has a unique design having a set of codes and attributes as used in programming languages in place of regular suites. Have it and it would gear up your free time with some fun. An LED-powered tray that glows by your touch and allows you to view your stuff on that tray in the dark. The brightness sensor automatically make changes to the brightness of the tray according to the brightness in its surrounding space. It is switched ON and OFF by using only a touch of yours on the tray. Another great LED gadget that makes you play a video game in real life. The light effects of LED in the game make it more exciting and playful. Place this lamp on a table or desk and play tetris in real life with varied customizations in its appearance. This article was published in Technology and tagged Gadgets. How Can Digital Technology Improve My Business?